The MHP is a self-contained, mini-skid, hot water pressure washer with an extra narrow frame for maneuvering through doorways. 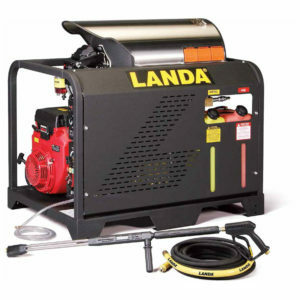 While it is considered an economy model, it is still packed with Landa Karcher Group quality, including reliable Honda or Vanguard engines all with electric start, top-of-the-line, belt-drive, tri-plunger Landa Karcher Group Pump with 7-year warranty, Schedule 80 heating coil made of 1/2-inch cold-rolled pipe, and extra rugged steel frame protected by an polyester powder coat finish. 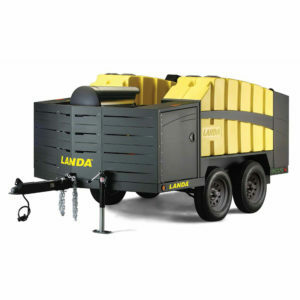 The MHP is easily fitted with an optional wheel kit to make it portable for on-site cleaning. No electricity is needed. Simply provide water and it’s ready to clean most anywhere outdoors. 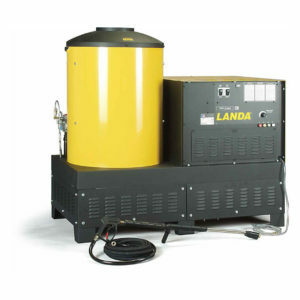 The two five-gallon gasoline and diesel tanks (18 hp model only) allow for hours of continuous cleaning. The MHP comes standard with the bracket needed to add an optional hose reel for tangle-free washing and additional high-pressure hose protection.